I'm always a sucker for the Sephora Favorites sets! They generally throw together some great products for a value price. I've been eyeing this particular set for a few weeks and finally broke down and got it! The Sephora Favorites sets always have some sort of theme. For the hot season, they threw together some interesting products into the "Summer Stash" set. It retails for $45 and comes with 9 mini beauty products. 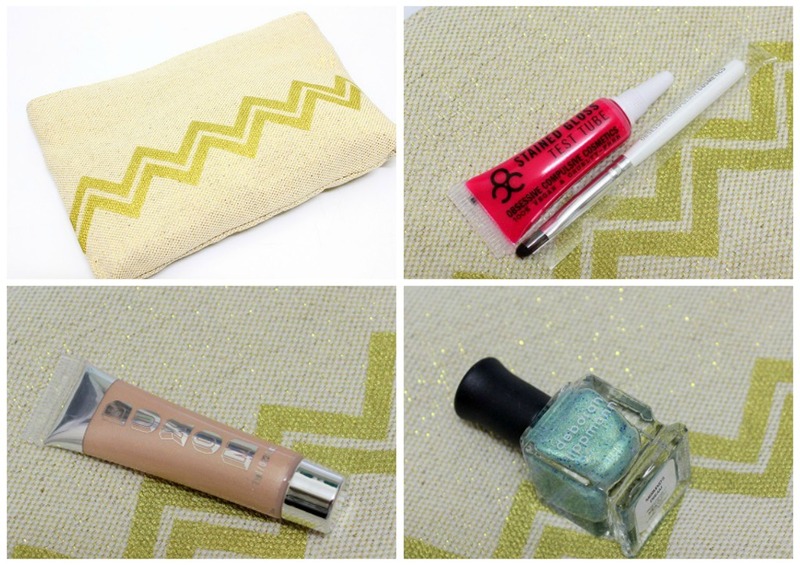 Canvas Makeup Bag - I love the cute bag the set comes with. It's not tacky like some value kits tend to contain. It's perfect for a beach bag, lake tote, or even to keep sunny day essentials in. OCC Stained Gloss "New Wave" (with brush) - I've always been intrigued by these OCC lip tars! However, this one is a bit different from the originals because it's supposed to be a stain and gloss in one. I'm not too crazy about the color but it does come off a little more sheer than it appears. Buxom Divine Goddess Luminizer "Venus" - This is something I've been dying to try! I love Buxom products and think they deserve much more hype than what they get! I haven't had the chance to try this yet but I'm hoping for a winner! Deborah Lippmann Nail Polish "Mermaid's Dream" - I know this is a cult favorite among the nail polish lovers out there. I haven't worn nail polish in over six months! However, I'm totally in love with the duo chrome finish and big sparkles in this polish so I may have to break my streak! Stila Magnificent Metals Shadow "Kitten" - I swear, this set had so many things I've been wanting to test out (obviously why I broke down and bought it.) Take one swatch of these shadows and you'll be mind blown. The consistency is fabulous and full of creamy shine. I can see this being a staple in my summer routine! NARS Bronzer "Laguna" - Lately I've been on a big NARS kick (I recently got some products for a 500 point perk..look out for that post coming soon!) 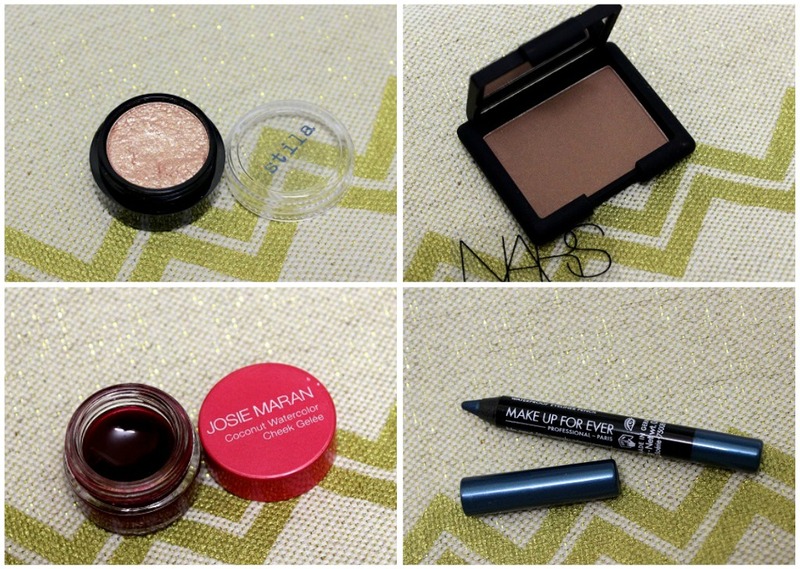 so naturally, I had to try out the oh so raved about Laguna bronzer! Another exciting product for me! Josie Maran Watercolor Cheek Gelee "Pink Escape" - My obsession with Josie Maran is out of hand currently. I want everything this woman makes! The Cheek Gelee seems to be a really interesting concept. Don't let the color fool you, it is actually a sheer fuchsia pink when applied! Makeup Forever Aqua Eyes Waterproof Eye Liner "12L" - I'm not going to lie, I wasn't too excited about this product. Had it been more of a neutral or subdued color, I might have went for it a bit more. I know the trend is to wear a pop of blue under the eyes but when you pay almost $50 for something, you want it to be something you can incorporate into your routine daily. Marc Jacobs Lash Lifter Mascara - I haven't heard much about this and I'm not sure why it's considered a summer favorite. I was expecting something that was waterproof or tied in with summer somehow. Anyways, who knows, this may be a bomb diggity mascara? Anyone tried it? Urban Decay All Nighter Setting Spray - Woot woot! Another product to get my excitement up! I can't tell you how many times I've picked this up at ULTA but suddenly bailed on buying it thanks to my trustee NYX Dewey Finish Spray. I'm glad this bottle will give me a chance to see if it's really worth the hype! Overall, I loved the product selection. There were a couple things I wasn't crazy over (mascara and eye liner) but everything else was on point! The products are pretty small and I honestly thing the price should have been downsized to around $30-$35 for the amount of product you're receiving - but my consumerism always gets the best of me and I give in anyways! To be more on the positive side, we do travel more in the summer and the smaller versions will definitely come in handy for traveling purposes. I don't think these are products that will run out any time soon, either. What did you guys think about this set? Let me know! There's a Sephora opening up in my city in a week, and this is tops on my shopping list! 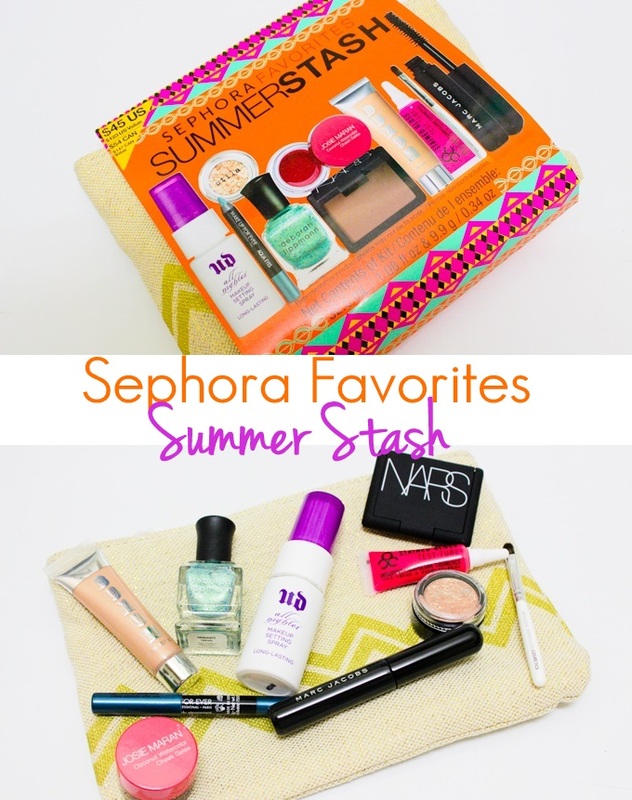 Usually, I can't justify buying the Sephora Favorites kits, even though I love the idea, because there just aren't enough items inside that I've been wanting to try. For once, it's like they read my mind! I'm totally with you - I'm not too excited about the mascara or the liner, but everything else looks awesome! This it is super tempting. I have been wanting to try the Deborah Lippman Mermaid's Dream, and this seems like a great way to test it out. Plus, I am in love with the bag! awesome the link trouble between laptop and also mobile shareit download for pc Discover the file on your phone, show it, play it or SHAREit great.